Rumor: PS3 Motion Controller Is Actually Called "Arc"
Rumor has it that the PS3 motion controller will actually be called "Arc," which is unfortunately a much less outrageous name than "Gem." 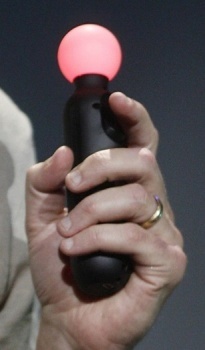 Last month, Electronic Arts CEO John Riccitiello let it slip that the unnamed Sony motion controller for the PS3 was not actually called "Colored Ping-Pong Ball On A Plastic Stick," but instead had been named "Gem," a moniker that industry insiders quickly dubbed "truly outrageous". As it turned out, Sony quickly backpedaled from such an outrageous name, claiming that "Gem" had merely been a development codename and was not the final decision. A reportedly reliable source told VG247 that the PS3 motion controller would be out this year - to match competitor Microsoft's Project Natal - and would officially be called the "Arc," which I suppose is kind of cool, but doesn't have the impact or the oomph that I suspect Sony was hoping for. Keeping in mind that - at last report - Project Natal was just a codename as well, this might leave Microsoft as the only one without a public name for its motion control device. That is, of course, assuming that the source's information is true - which is by no means guaranteed. So, "Wii," "Arc," and "Natal." Boy, this console generation has some really weird hardware names, doesn't it?